WHOA BABY! LOOK at THIS VIEW!!! You're special and you deserve this! Take our new VIDEO TOUR to see our entire property in 3-D...just copy and paste the link below into your browser to literally walk through our entire home! What you see in our pics is EXACTLY what you get...all pics are current and taken in recently! And our calendar is ALWAYS current and up to date too so you can instantly book right now! Ask about stays longer then 7 days and check ins that aren't Saturday to Saturday...we may be able to accommodate you depending on the time of year! 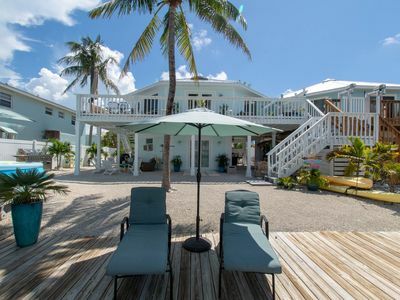 Welcome to the luxurious “Yellowtail” Villa, where luxury meets the Gulf of Mexico! 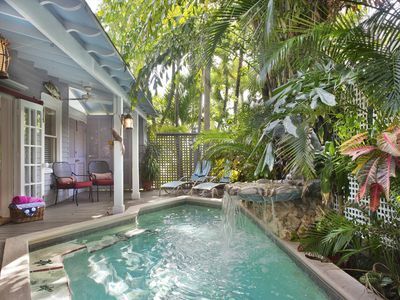 The only problem with this vacation rental is you won't want to leave! From our private 35 ft. high roof top deck with its’ AMAZING views of the Gulf, tiki bar, private 6 person hot tub, rooftop fire pit, private boat slip, luxury bedding, linens, and even your very own private elevator, our “Yellowtail” Villa has it all for your next family vacation! 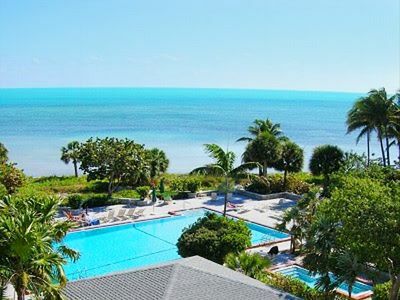 Located at mile marker 53.5, Bougainvillea Villas, is a Gulf side private, gated community of just 14 free standing, single family homes in Marathon overlooking the Gulf of Mexico. This is not a duplex or condo and there are NO shared walls. At Bougainvillea Villas, the units run perpendicular to the Gulf of Mexico so the higher your villa number, the closer you are to the water. Our villa is a very desirable #12 so you are VERY close to the water and pool and have direct open ocean views of the Gulf of Mexico!!! WE CAN SAVE YOU A CREDIT CARD FEE IF YOU DON'T USE A CREDIT CARD! 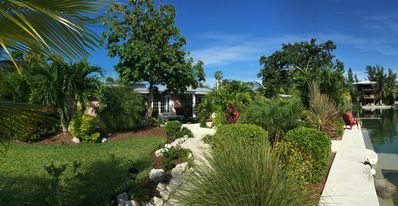 We are centrally located in Marathon and close to all the local amenities… beaches, restaurants, bars, and grocery stores. We are also across the street from the famous Capt. Hooks Marina/Dive Center and the Florida Keys Aquarium!!! You can walk to both from the YellowTail as well as the Marathon Visitors Center to find out about all the fun things to do in Marathon. No long car rides here are necessary for your Keys adventure! At the Yellowtail Villa, we strive to make you and your guests feel extra special with exquisitely decorated high end furnishings, luxury linens, bath towels, and bedding, Built in 2007, the Yellowtail Villa is the very best that the Bougainvillea Villas community has to offer with unsurpassed views and amenities. 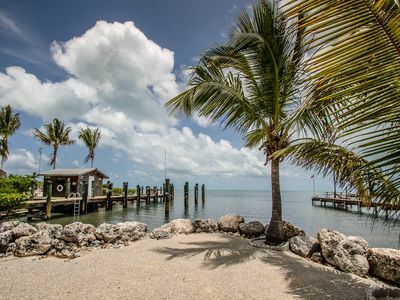 After all that is why you come to the Keys to be close to the water and the views and we have it all at the YellowTail Villa. One of the most spectacular features of our Villa is our private 35 ft. high roof top deck directly overlooking the Gulf of Mexico. There you will find the most amazing direct ocean views. 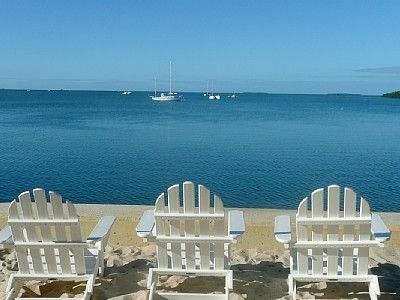 It’s the ideal place to enjoy your morning coffee, sunbathe, do yoga by the Gulf or just watch the boats float by. 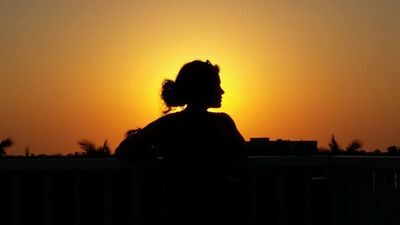 Stargazing at night from the roof top deck is sublime! We even have a delightful brand new fire-pit for nighttime cocktails and S'mores! Yes we supply the marshmallows and skewers too! 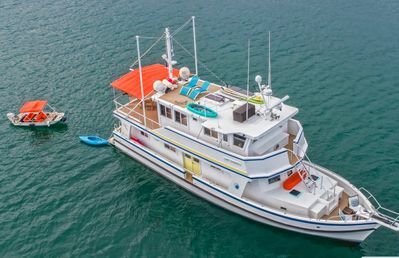 and just added in October 2018, a commercial roof top viewer to see far out in the Gulf of Mexico! After a long day of fishing, escape the heat of the day on one of our two covered and shaded patios which all have water views. Underneath our Villa you'll find more open water views at your exclusive Corona Relaxation Tiki Bar surrounded by potted palms. Enjoy a cool cocktail with surrounded by cool neon signs, party lights, fish netting, and fun bar signs await your arrival. We even have Captain Morgan for you to take a selfie with! Grill your catch on our BBQ or take a dip in our 6 person private hot tub to soothe your aches and pains while watching TV on a 40” flat screen! 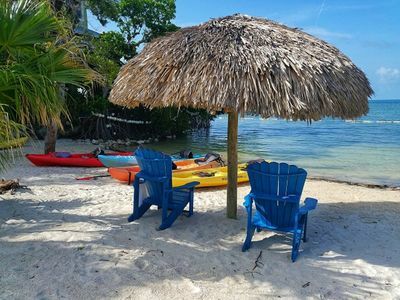 Relax and read a good book in the cool shade and breezes from the Gulf of Mexico on our luxurious outdoor furniture or have dinner at our 6 person outdoor table. Just a few feet away, you can stroll over to the heated community pool to take a dip morning, noon, or night next to the Gulf of Mexico! You can even directly watch your kids swim in the pool from our rooftop deck! Only Villas 12, 13, and 14 offer that! Fishing is the best in Marathon and from our dock! 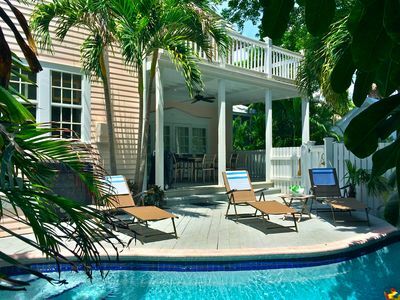 Centrally located on Vaca-Cut, (an inlet between Keys) this location is a fisherman’s dream! You'll have quick access with your boat to the Gulf and Atlantic giving you the maximum amount of fishing and boating time. No long and winding boat rides here at no wake speed. 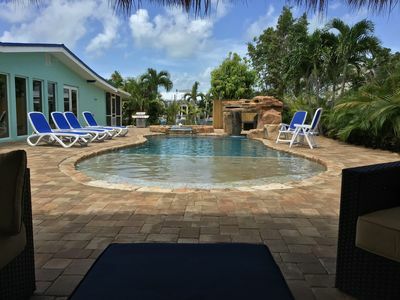 You’ll have your very own private boat slip that is exclusive to Villa # 12 for up to a 25’ ft. boat, There is also a bait freezer at our Villa, and a fish cleaning station with fresh water all available right at the dock. We also offer free trailer on site parking for your boat trailer. 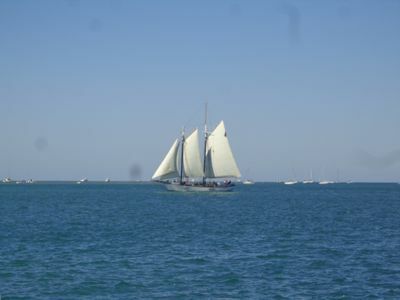 We even have excellent local fishing Captains who know that waters better then anybody.... you can hire them to take you out on your boat....they bring all the gear, poles, and tackle, and you catch the fish! Don’t have a boat…no worries, enjoy amazing fishing for a variety of species right from the dock with our complimentary fishing poles located in our exclusive "Fisherman’s closet"! Sharks, Grouper, snapper, snook, tarpon and many more species all cruise through the currents of Vaca-Cut creating an ideal fishing environment, especially at night! We also provide complimentary beach towels for the whole family, two beach chairs, a variety of sand toys, life jackets, a boogie board, dive masks, and noodles for the pool...all complimentary for your stay! Inside the YellowTail Villa a fully stocked gourmet kitchen awaits you with granite countertops and stainless steel appliances that opens to a living room and dining area with a 60” flat screen TV. We also provide a Cuisinart K-Cup coffee machine for fast coffee anytime of day. All three of our private bedrooms feature a flat screen TV’s, luxury bedding, linens, and pillows. You’ll also enjoy free wifi and a land line phone to keep you in touch to the outside world if you choose. Leave your hair dryers at home because just like at a hotel, each of our bathrooms have built in hair dryers! Washer and Dryer is also included the Villa! For any needed "baby gear" we direct all of our guests to www.babysaway.com in Key West Their number is 954-398-3763. They are awesome and have all the baby rental gear you may need for your vacation week ie...car seats, strollers, cribs and other quality baby equipment more you may need for your stay. Another great asset to our Villa is its' very own elevator! 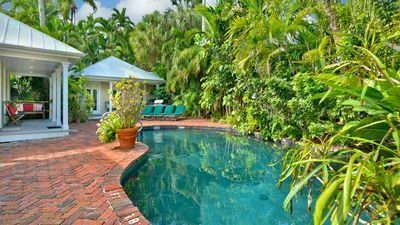 Most homes in the Keys are elevated with long flights of stairs making transporting heavy items a pain throughout your vacation week. But have no fear, there’s an elevator here! Yes The Yellowtail has it’s very own elevator to transport you and all your heavy luggage and groceries up and down all week long throughout your vacation week. 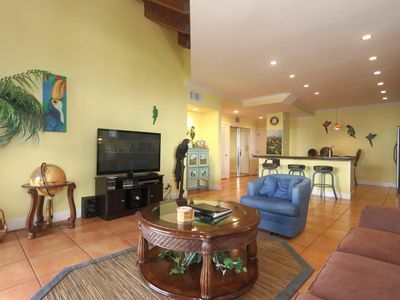 The Yellowtail Villa is a premier vacation home in an ideal open water location. It's the quiet and relaxing vacation that you’ve waited all year long for!! Our recent pics tell the whole story, what you see in our pics is EXACTLY what you get! You won't be disappointed with the amenities and quality of our beautiful YellowTail Villa and the open water views will be blow you away! 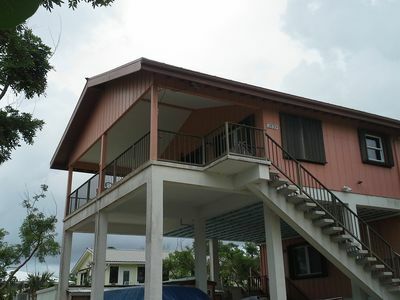 Have a really large family of group coming to Marathon, ask us about renting more then one Villa! 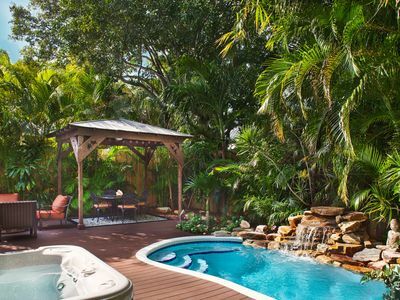 Check out our 5 star reviews to see how other guests have enjoyed this amazing vacation rental property! Checkout time is 10 a.m. Check in time is after 4p.m. We hope to see you soon at the Yellowtail at Bougainvillea Villas! 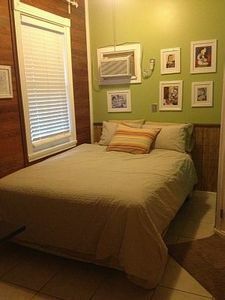 Quiet, Quaint, and Conveniently Located! 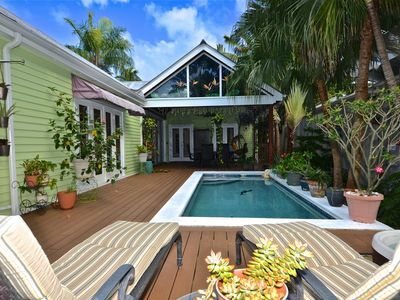 Vibrant home w/hot tub & private pool blocks from the beach - dog-friendly! 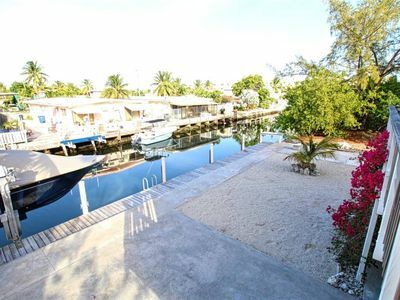 Pretty Canal-front 3/2 Family Home With Private Dock Easy Ocean Access. 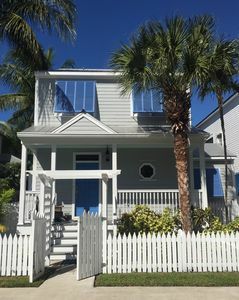 4BR 3-1/2BA, Waterfront , 60' Dock,Heated Pool/Hot, Tub, Tiki, pet friendly!